Mom's Gone Bronson! : Yves Rocher - Flower Party By Night! Review! 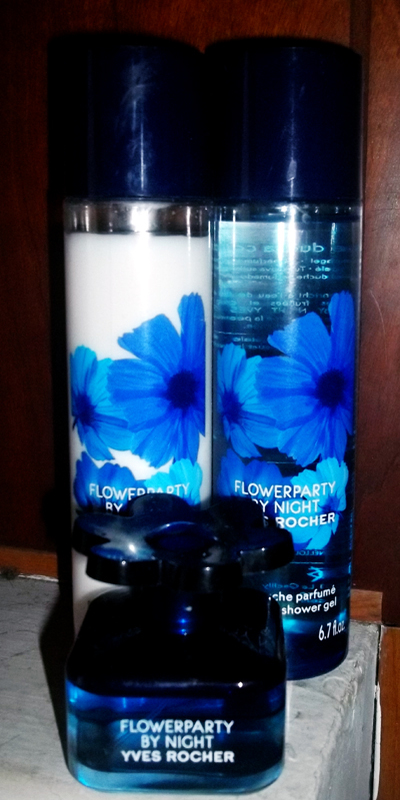 Yves Rocher continues to keep me happy this month with FLOWER PARTY BY NIGHT, which houses a WONDERFUL fragrance resembling light floral, vanilla, sweet tones that you can't help but adore!! I have the shower gel, lotion and perfume, which comes in a beautiful little deep-blue bottle with a petal shaped lid and looks super on the dresser and wears well! The scent is long-lasting throughout the day and not too overpowering at all! When used in conjunction with the lotion and gel you just can't go wrong for an all-day scent and touch of confidence! I apply the lotion after a shower, which allows it to soak into the skin without leaving a greasy film and i'm ready to go! If I want to soften up my hands or anything through the day it is easy to just re-apply a little more without over doing it! One spray of the perfume here and there is more than adequate to get a feel for the scent to make an impact and I actually like to spray a little on my faux flowers, to give the room a little "umph! ", too! Fabulous! This is such a pretty set, and a good scent, that I think it would make an adorable gift for just about anyone and so it might be worth picking one up for Christmas (I know, but it IS coming!) or to put away for a special occasion! Of course, it never hurts to treat yourself to some, either! I would call this an every day scent that you could dress up for any special event with ease! I really do love everything about it, except the fact that one day, the bottles will be empty!! That part makes me sad - but there will be more, which you can pick up from the Yves Rocher website, HERE! I have yet to find a product from Yves Rocher that I didn't like and they truly are on a roll! I look forward to bringing you more form Yves in the near future, so keep your eyes peeled!! Check out the Flower Party By Night range, today - and let me know what you think! Disclaimer: I received all of the mentioned products for the sake of the integrity of this review. My opinions are honest, open and my own and yours may differ! Thank you!